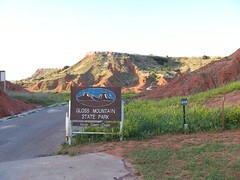 A recreational-educational park that is accessible for hiking and picnicking from sunrise to sunset. Facilities include a restroom, picnic pavilions, picnic tables, grills, public water supply, handicap trail to historical marker, and a hiking trail from base parking lot to the top of Cathedral Mountain and across the mesa to view the valley floor and Lone Peak Mountain. 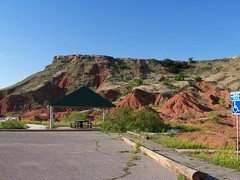 Points of interest include land geography, geological formations, selenite gypsum, scenery and wildlife. 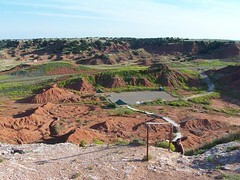 This range is also known as the Glass Mountains. 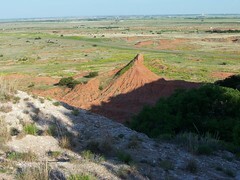 From I-35, go W on Hwy 412 about 50+ miles to Orienta, then begin a scenic 24 mile drive. 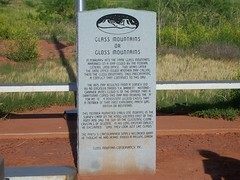 Gloss Mountain State Park is 5 miles W of Orienta on Hwy 412. 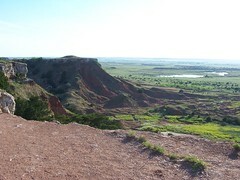 Days/Hours Open: Open daily for hiking and picnicking from sunrise to sunset. Vehicular traffic: 7am-9pm CDT and 7:30am-5pm CST. In February 1973 the name Glass Mountains appeared on a map issued by the federal general land office. Two years later the same office issued another map calling them the Gloss Mountains. Thus precipitating a conflict that continues to this day. The 1875 map resulted from a survey led by an engineer named T.H. Barrett. Historiographer James Cloud is of the opinion that a draftsman copied this map and misread the "A" for an "O". A persistent legend exists that a member of that first exploring party was British or Bostonian. This member awakened early one morning in the survey camp on the knoll located east of this point and saw the sun on the glistening clear crystals of selenite. In his long Eastern dialect he exclaimed. "Why, they look just like glaws." The party's cartographer simply recorded what he thought he had heard, indeed a passing error. The sidewalk you are standing on was built on the original highway grade referred to as a "thoroughfare" in 1924, state highway 47 in 1927, and state highway 15 in 1930. Since horse powered equipment could not penetrate the mountain where the current highway travels, it necessitated taking the route of least resistance. Hence, the gap between the mountains where this sidewalk traverses was chosen for the route as well as the gap at the park entrance. 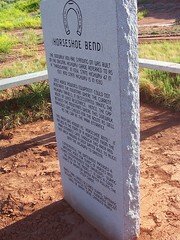 This area was known as "Horseshoe Bend." 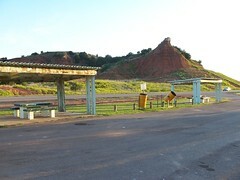 it arched in form of a horseshoe from the park entrance gate through this area and then back around a deep water hole to align with the highway to Orienta. Conveniently, the waterhole provided a water point for teams of horses and fishing entertainment for travelers. During the days of the Model-T, it was a good source of radiator water after pulling the steep grade. Many card games occurred during watering sessions, needless to say, numerous wagon loads of wheat were gambled away.